Included in the email was a freshly annotated specimen (see below) from Chelan County, Washington; a dead ringer for Pyrola crypta. What do I see when I look at this specimen? First off, I have seen P. crypta leaves like this before– they are long, narrow and dentate like P. dentata, but they have the same coloration as P. picta. Second, Ryan provided a close-up picture of the inflorescence that shows how long the sepals and floral bracts are. These are the best characteristics for distinguishing this species from P. picta. Finally, I see that Ryan has annotated this particular specimen and cites the key that I published with the species description for P. crypta in Taxon. As it turns out, I did not find (and so didn’t sample) any specimens of P. crypta from the northern Cascades in Washington for my study, so this specimen from Chelan County is a great contribution (see map below) to our increasing knowledge of where the range boundaries for this species are. Why do we care about the range of this species? 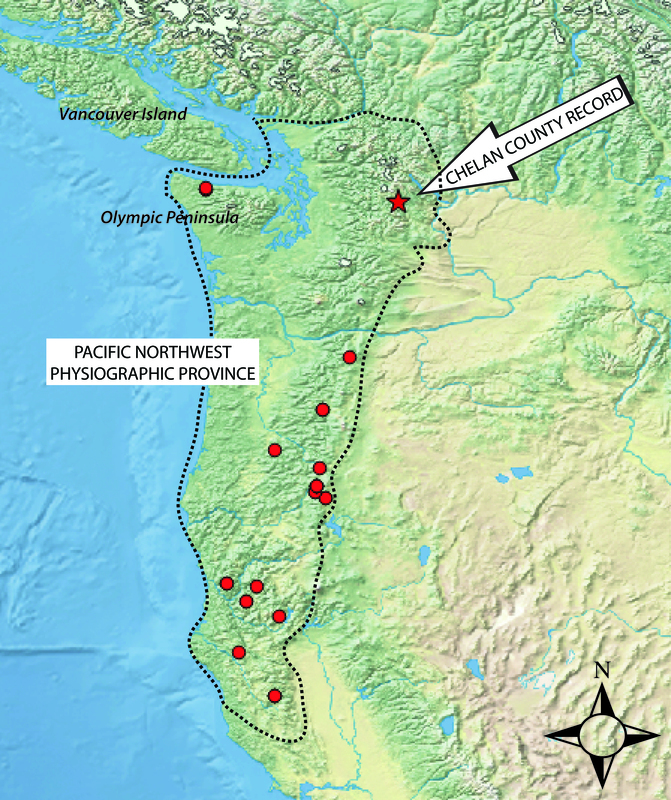 Locations of P. crypta (red symbols) within its geographic range (area within dotted line) in the PNW. 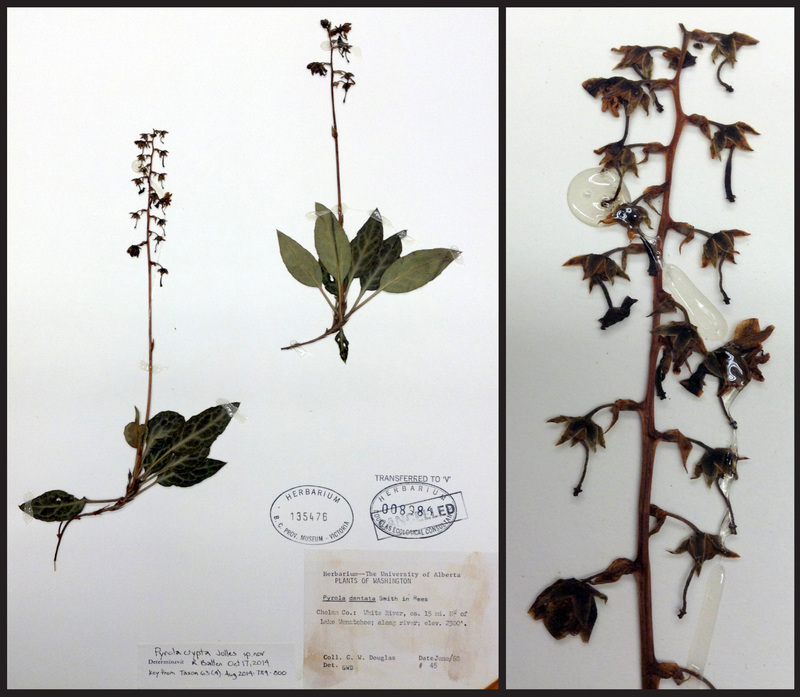 The annotated specimen featured in this blog post (red star) will expand my understanding of how P. crypta has evolved! All species are thought to possess a niche, variously defined as the resources and environmental conditions that a species requires and has adapted to over time. The species niche for a plant is something that can be estimated by recording the geographic range and habitats that a single species grows in, then determining what the environment and necessary resources are like within that range. As you can imagine, species growing together (like roommates) may partition their needs to minimize among-species competition for resources. So, why does it matter if we know where P. crypta grows? Well, as the climate changes and forest conditions change, P. crypta will likely ‘migrate’ (i.e., disperse and then survive) within its niche. 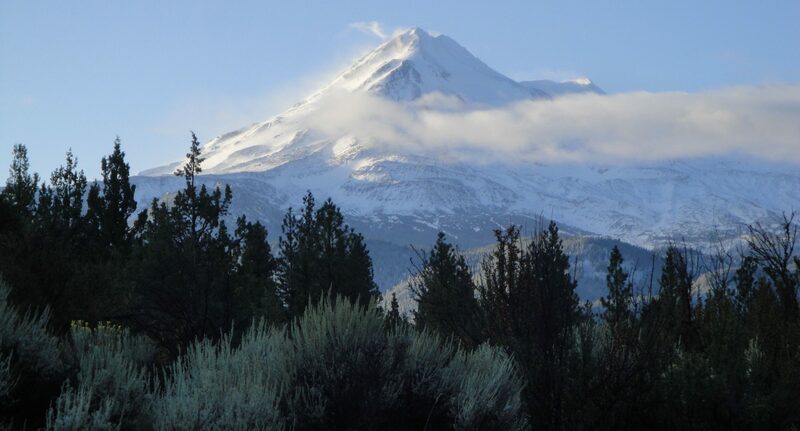 If conditions become too hot and dry at lower elevations, the forest habitat will likely shift to higher elevation– those plants of P. crypta able to disperse to the shifted, optimal habitat will survive. When I add the Chelan County locality for P. crypta to my dataset, it will make my estimate of P. crypta’s niche more accurate. Since I want to know how forest habitats and inhabitants will respond to climate change and resource availability, this is very useful information! Given where these plants exist now… where will they disperse to in the future? Species ranges and ecological niche partitioning are VERY fascinating subjects — I can’t wait to read your paper about this topic using Pyrola! How gratifying to hear from another botanist that he has actually collected and recognized the species you discovered and named! Bravo! And of course his information, as you point out, helps define more accurately the range of P. crypta. Oh, yes. I’m glad the key is useful! This fellow didn’t collect the specimen actually, he was just going through the Pyrola specimens in the museum in Victoria (BC) and found this one! The collection was actually made by G.W. Douglas in 1968 (or 1963?). Speaking of dispersal, I searched the Googles and couldn’t find any good images of P. picta’s seeds. PLANTS doesn’t even have photos. Cool post and I hope that all’s well! I will make this the subject of a future post! Thanks! I have found a number of these plants in southern Douglas County, CO, in an area adjacent to Pike National Forest. They are just about to bloom-maybe within the week. One spot has several different types of Wintergreen growing in the same area. This is where the multiple plants Pyrola picta are growing. Some of the plants I’ve found are growing in small clusters, others in singles, most often not surrounded by much of anything. Thank you very much for this information– it really helps my studies! Previous PostPrevious “Leafless” Pyrola: are they distinct species?